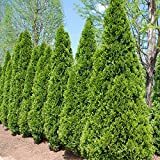 Thuja occidentalis growing tree or shrub of the genus Thuja also known as Arborvitae or White cedar, Thuja occidentalis perennial pinophyta used as ornamental plant, can grow in temperate climate and growing in hardiness zone 2-9. 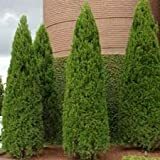 Leaves color green in scaly shape, the tree grow in a cone shape. Flower color yellow-brown grow in the end of the leaves look like dandruff. 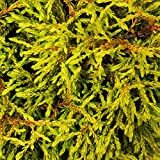 New Arborvitae Tree Shrub Bush Evergreen , (Arborvitae Occidentalis) or (Thuja Occidentalis) , 150 Seeds !